A selection of pictures obtained during the Conference can be found HERE. As an expression of respect and gratitude to the scientific career of Antoine Salin, and due to his recent retirement, a scientific workshop will be held in Donostia - San Sebastian at the end of october. The workshop will include several sessions on different hot topics of active research in the fields of gas-surface dynamics, atomic collisions in the gas and solid phases, and other related subjects. The final version of the scientific program is provided here in PDF format. The list of participants is provided here in PDF format. - Double room single use (+ 1 person breakfast): 81,60 euros/night. - Double room (+ 2 persons breakfast): 46,00 euros/person/night. 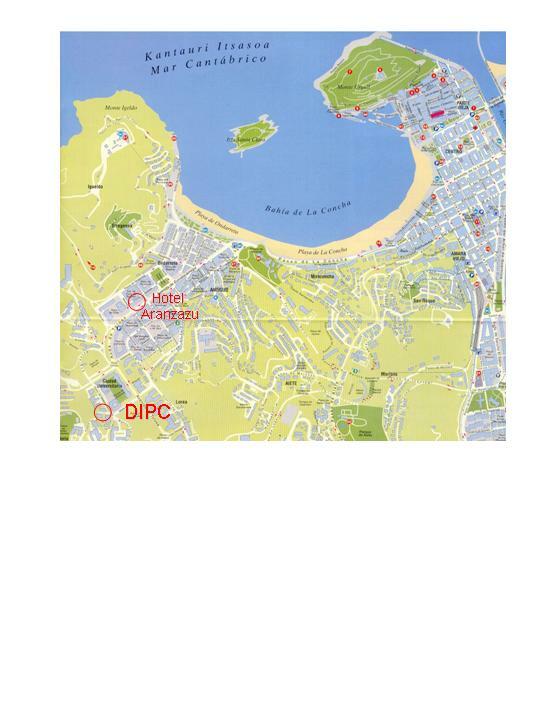 The Hotel Aranzazu is located at walking distance from the DIPC, where the workshop will take place. It is also located at walking distance from Ondarreta beach. Please contact directly the hotel to make a reservation, either by email or phone (see above). You should mention that you are attending the 'Workshop Salin' at the DIPC ('Congreso DIPC - Salin', in Spanish) in order to get the special rate. Reservations can also be made on-line following the link provided above. If this link does not work, please go directly to the main page of NH Hotels (http://www.nh-hotels.com), and look for Hotel Aranzazu in San Sebastian. In any case, please mention along the on-line reservation process the reference 'Workshop Salin - DIPC'. A 'comments' section is provided in the reservation form and could be used for this purpose. Nevertheless, the rate appearing in the reservation form will be the standard one, and not the reduced rate that you will be finally charged. If you prefer to share a room, please let the hotel know with whom, among the workshop participants, would you prefer to do so. If you do not have any particular preference, the hotel will take care of distributing the participants over the available rooms. Please be aware that we cannot guarantee neither the special rate nor the availability of rooms if your reservation is not made before September 15th. Accommodation in Donostia, or go directly to the web page of the Donostia Town Hall. The nearest airports to San Sebastian are San Sebastian airport (national flights via Madrid and Barcelona, and 20 km from the city centre), Biarritz Airport (France, and 50 minutes driving from San Sebastian) and Bilbao Airport (100 km from San Sebastian). Train is also a valid option.